For university recruitment and admissions teams, it’s hugely important to have a comprehensive CRM to optimise recruitment strategies. A forward-looking CRM can help convert more applicants into enrolled students, enhance communication, streamline administrative tasks and ultimately free up precious time. With a myriad of products, all containing a range of features focused on optimising some part of your day-to-day job, it’s easy to lose sight of the needs of your most important stakeholders – your candidates. While it’s important to optimise your daily tasks, it’s imperative not to get caught up in any details which will remove your candidates from the forefront of your mind. When considering a CRM, you need to put the applicant experience first. Below are some key features you should prioritise. At Bett 2017 I attended a talk titled what can universities do to attract Generation Z?. The talk included some interesting statistics, including the fact that 90% of the UK’s 16-to-24-year-olds own a smartphone. In addition, 62% of 16-to-24-year-olds research universities on their smartphone. This suggests prospective applicants are prioritising digital resources over open days, webinars and direct conversations with university staff. The speakers went on to explain how this unprecedented rise of mobile phones and electronic devices has effectively shortened our attention spans. Millennials and members of Generation Z are especially affected. For this reason, recruitment teams need to pay special attention to detail when designing their application journey. The application process needs to be optimised for mobile. Universities still using paper applications are at a massive disadvantage. If you’ve built your application in-house, it’s imperative to make sure the form is customisable and that there are no bottlenecks which will require attention from IT. Any IT issues may result in a lengthy wait for a fix, during which your candidates may feel encouraged to apply to programmes at other institutions. Try and compress the application process so prospects can complete it in one sitting. Having been an international applicant in the past, there is nothing I appreciated more than a friendly person on the other side of the application process, guiding me through each stage. A lot of universities failed to provide me with this level of service, and as a result, I lost interest in their institution. I later realised that these universities’ recruitment processes were hindered by a lack of visibility into my application activities. When considering a CRM, look for one which enables full visibility into each applicant's stage in the application. This will give you insight into where they’re stuck, what information is still pending and the candidate’s overall quality. For example, you may see your candidate Rob Parker is 80% through the application process but hasn’t made an update in the last two weeks. Once you’ve identified this, you can be proactive and reach out to see if he’s reached a roadblock. Visibility is essential to ensure you deliver the best possible experience to your applicants. Communication is key for both domestic and international applicants. Communication must be tailored to apply to applicant’s individual requirements, interests and stage in the application process. As an example, you might have decided you’ll offer scholarship options to all Chinese applicants if they have GMAT scores of over 600 or over five years of work experience. A good CRM will let you filter this demographic so you can seamlessly communicate this message to these particular students. A good CRM will not only give you the visibility on this information but also give you the appropriate tools and templates to communicate your message effectively. 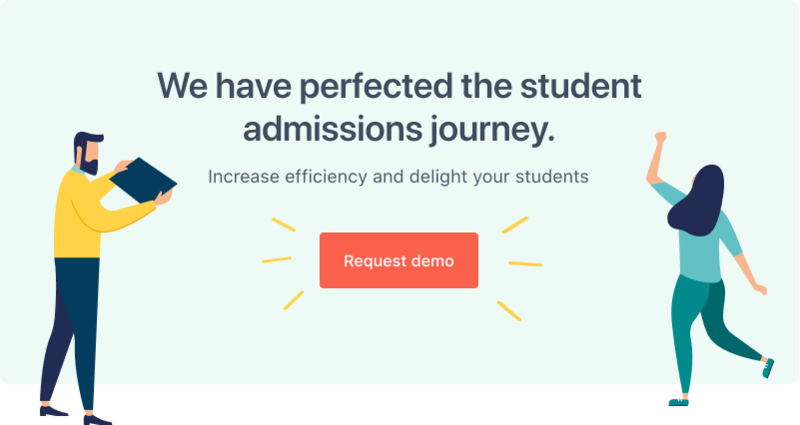 If you’d like to learn how a modern CRM tailor-made for higher education could benefit your admissions process, schedule a free consultation with a FULL FABRIC team member.